… you’ll have noticed a large overhaul to this site. Big changes are in the wind. The kid is graduating in June, and Jess and I are looking to move and expand into new digs. I thought the changes should extend into my web presence as well. Sort of throwing a new coat of paint on the beast. The pages are a bit more collected and organized and more importantly the content has been updated. New art work for everyone! The hope is that with change comes the chance to create better habits. I plan to post more often, not just in the blog but updating the core content whenever I can. New Papercut Kids comic pages are getting done, and I plan to update that site soon as well. New projects and an eventual shop will pop up here to sell prints and sketch books. Stay tuned for more! Did a little sketch of Spidey punching the Hulk. Just a warm up doodle and I liked it enough to add a couple of panels at the bottom to drive home the dopiness of a young Peter Parker. I light boxed it on to some bristol and inked it with pentel brush pens and copic multiliners. 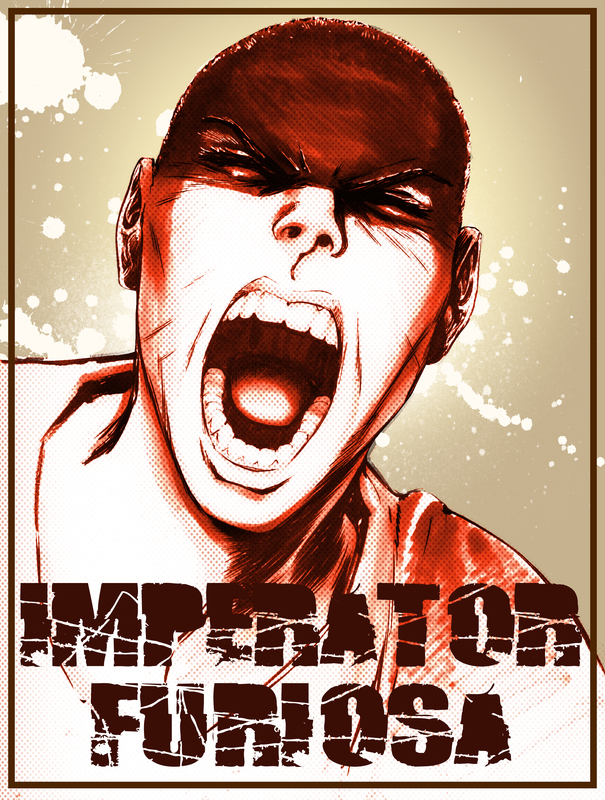 Then I colored it on Photoshop. It’s candy neon goofiness and I approached it like a coloring book, but I like the look of it. I hope you do, too! Whooo-bwoy! This was the sketch for the 31st and final day of INKtober. Every. Damn. Day. and I’m continuing the challenge. Posting a sketch-a-day until I do not. You can check out the full INKtober 2015 ride over on papercutkids.com or just click HERE. You can follow the sketch-a-day posts @pprcutkid on instagram and twitter! 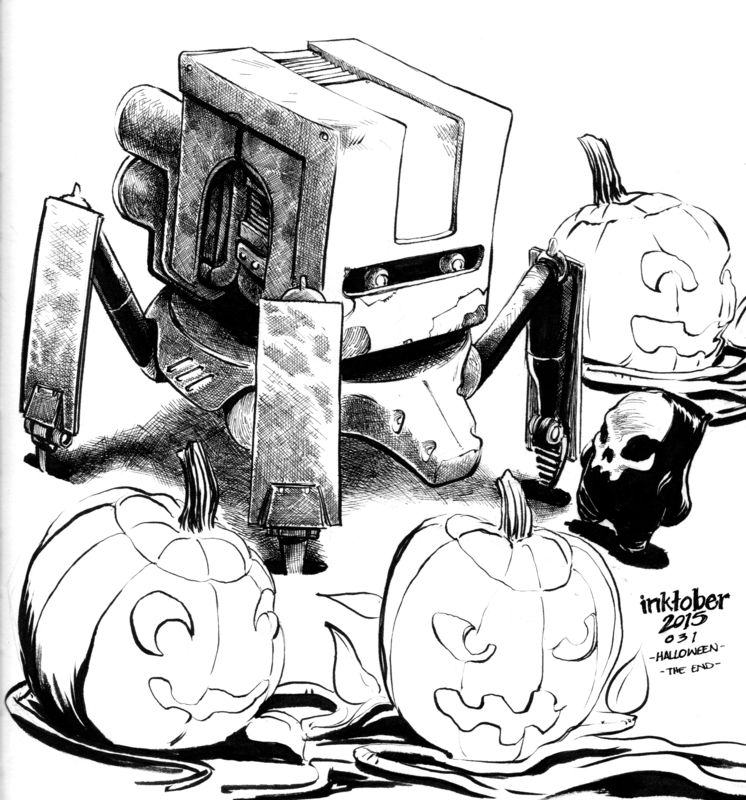 For anyone looking for INKtober 2015 sketches head over to papercutkids.com or to the official Facebook page for daily updates. I put restrictions on myself to only do characters from The Papercut Kids and Derelicts, a boy and his robot tale. I’m curious to see if rules and restrictions truly bolsters creative thought or if I hit a motivational wall. I’ll also have an INKtober 2015 gallery up in November. So click on over and I hope you enjoy! I loved me some Daredevil on Netflix and, heaven help me, I enjoyed the second season of Agents of SHIELD (in that way you enjoy goofball shows in the background whilst toiling away on your own goofy endeavors). SHIELD is also on Netflix if you care, you’rewelcomeverymuch! The fine folks over at Nerds of Color wrote a very fun piece on how SHIELD is the new Firefly. Read it here. Below is the itch that needed to be scratched after consuming so much nerdy content. Final art and process pics. If you’re a colorist looking to dabble feel free to grab the BW and go to town. If you post your work just give credit where credit’s due! rage fueled film making capturing an unrelenting kaleidoscope of a fever dream. uncommon clarity of vision for a horizon on fire and characters, mad every last one, racing to the inferno. Just a little image dump of some in-progress strips I’ve done as warm-ups and writing exercises. I love me some comic books and will ride-or-die for funny books until my eyes fall back into my skull, BUT I’ve always had a deep, deep appreciation for comic strips. Calvin and Hobbes, ZITS, The Farside, Doonsbury, The Boondocks… the list is long and varied but suffice to say that they’ve all influenced me in one way or another. This is my nod to the doodle gods. If you want to see the finished strips just head on over to papercutkids.com, scroll to the bottom and click the box. OR just click this.